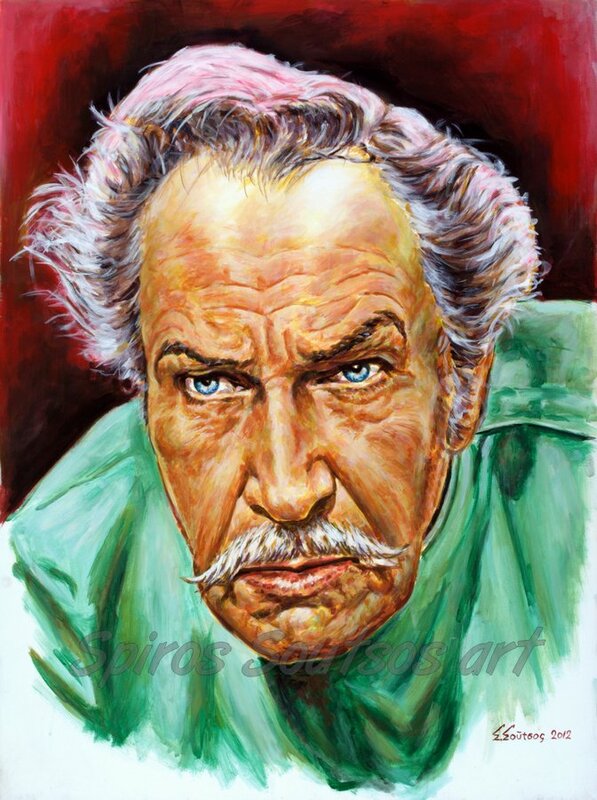 Vincent Price was born in St. Louis, Missouri (May 27 1911) and was an American actor, well known for his distinctive voice and performances in horror films. The latter was the reason he was called “Master Of Horror”. He appeared on stage, television, radio, and in over one hundred films. He has two stars on the Hollywood Walk of Fame: one for motion pictures, and one for television. Vincent Price attended St. Louis Country Day School. In 1933, he graduated with a degree in art history from Yale University, where he worked on campus humor magazine The Yale Record. After a year, he entered the University of London, intending to study for a master’s degree in fine arts. Instead, he was drawn to the theater, first appearing on stage professionally in 1934. His acting career began in London in 1935, performing with Orson Welles‘s Mercury Theatre. He made his film debut in 1938 with Service de Luxe and established himself in the classic film-noir Laura (1944) directed by Otto Preminger. He also played in other notable films such as Dragonwyck (1946), Leave Her to Heaven (1946), The Web (1947), The Long Night (1947) and The Bribe (1949), with Robert Taylor, Ava Gardner and Charles Laughton. Price’s first starring role was in the 1950 Samuel Fuller‘s film The Baron of Arizona. His first venture into the horror genre was in the Tower of London (1939) and then in The Invisible Man Returns (1940) and in a 1948 horror-comedy Abbott and Costello Meet Frankenstein. In 1956 Price played a villainous role in Cecil B. DeMille’s The Ten Commandments, along with Charlton Heston. In the 1960s, Price had a number of low-budget successes with director Roger Corman and American International Pictures (AIP). His first success was House of Usher (1960), which earned over $2 million at the box office in the United States and led to the subsequent Edgar Allan Poe adaptations of The Pit and the Pendulum (1961), Tales of Terror (1962), The Comedy of Terrors (1963), The Raven (1963), The Masque of the Red Death(1964) and The Tomb of Ligeia (1965). He also starred in a b-movie, The Last Man on Earth (1964), the first adaptation of the Richard Matheson novel I Am Legend. In 1968 Price portrayed witchhunter Matthew Hopkins in Witchfinder General. In the 1970’s, he appeared in three of the best horror movies of all-time, in Robert Fuest’s The Abominable Dr. Phibes (1971), its sequel Dr. Phibes Rises Again (1972), and in Douglas Hickox’s Theatre of Blood (1973). Price’s voiceover is heard on Alice Cooper‘s first solo album, Welcome to My Nightmare (1975), and he also appeared in the corresponding TV special Alice Cooper: The Nightmare. In 1982, Price performed a sinister monologue on the title track of Michael Jackson’s Thriller album. His last significant film work was as the inventor in Tim Burton‘s Edward Scissorhands (1990). Vincent Price died on October 25, 1993.